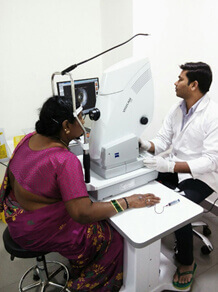 It is a test performed to identify the pattern of blood flow in the two layers of the back portion of the eye namely retina and choroid. The patient is advised to come to the hospital with an attendant. It is ideal to avoid eating anything for at least 2 hours prior to the procedure. Eye drops are applied to dilate the pupil. Any history of allergy to medicines must be revealed to the Doctor. A small cannula is placed in the vein of the arm. After taking a few pictures of the fundus (back of the eye), an orange-yellow coloured fluorescein dye is injected through the cannula. This dye travels through the blood vessels and reaches the eye within seconds when a series of rapid photographs of the fundus is taken. At this stage it is extremely important to keep still with eyes wide open to get the best quality of pictures. Sometimes after the initial series of pictures further pictures are taken after giving a brief break (late phase pictures). On the whole the procedure would last for about 15 minutes. During the procedure patients might sometimes have nausea. Taking deep breaths helps to tide over this sensation. After the procedure the skin and urine turns orange for about 48 hours. Drinking more amount of water helps in rapid removal of the dye from the body. As the dye is usually flushed out of the body through urine, this test is either avoided or done after taking a nephrologist (kidney specialist) opinion in patients with known kidney problems. Sometimes patients can develop rash, itching or tingling sensation. Mild anti histaminic drugs help to overcome this situation. Very rarely a severe allergic reaction causing breathing difficulty may be encountered which must be tackled on an emergency basis. Hence any knowledge of prior history of allergy must be shared with the doctor. This test is similar to FFA. It is sometimes used to complement the information gathered from FFA. 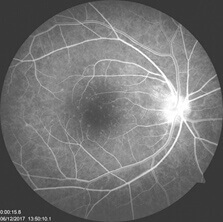 Information regarding choroidal vessels are obtained in greater detail than FFA by this test. The dye used is Indocyanine green which fluoresces in Infra-red spectrum of light. This property enables imaging even through blood, fluid or pigmentation.